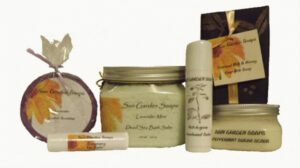 Welcome to Sun Garden Soaps where you will find natural and nearly natural handmade goat milk soaps, herbal soaps, natural beeswax lip balm, herbal bath teas, Dead Sea Bath Salts and many more good for your skin products to try. Our natural products are just that – natural- no preservatives or chemicals. We use only pure essential oils, the finest vegetable and nut oils and natural pigment for color. The nearly natural handmade goat milk soaps we make are at least 98% natural – reason being- some of our soaps contain high quality fragrance oils. Our handmade soaps are made with fresh goat milk, natural oils and butters known to benefit your skin. Goat milk has naturally occurring alpha-hydroxy acids which exfoliates and soothes while adding essential moisture to improve the condition and appearance of your skin. Goat milk contains proteins, minerals and high levels of vitamins A, D & E. It is said to be naturally anti-inflammatory, helps to maintain the correct PH balance and an excellent choice for people with sensitive skin, eczema and psoriasis. 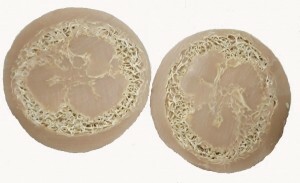 A slice of loofah infused in creamy goat milk soap. In order to produce our high quality handmade goat milk soaps we make everything in small batches. We use the cold process method in making our soaps which allows the glycerin to remain in the soap for its natural moisturizing ability. Our products are PARABEN FREE and are not tested on animals -just family members and willing friends. Our soaps do not contain chemicals like you find in commercially made soaps so they are not tear free. We grow the herbs used in our soaps and herbal bath teas. Our herbs are grown in chemical free soil using only homemade solutions for pest control. The information on our web site is for educational purposes only and not intended to be used to cure, prevent or treat any medical conditions you may have.